Sweet Summer Steals - Looks Under $150! Happy monday loves! We hope you all had a fabulous weekend - we got up to some pretty exciting things this weekend that we'll be able to share with you very soon but for today, I've got two super cute looks - both head to toe for $150! For a weekend running errands or a night out with the girls, these looks are head to toe complete for $150- can you say sweet deal?!! How sweet is this floral romper from Asos? I love the floral motif and the pretty colors are perfect for summer. Paired with a coral watch, some neutral sandals and some accessories that pop, you've got a great weekend look that's casual but still stylish! 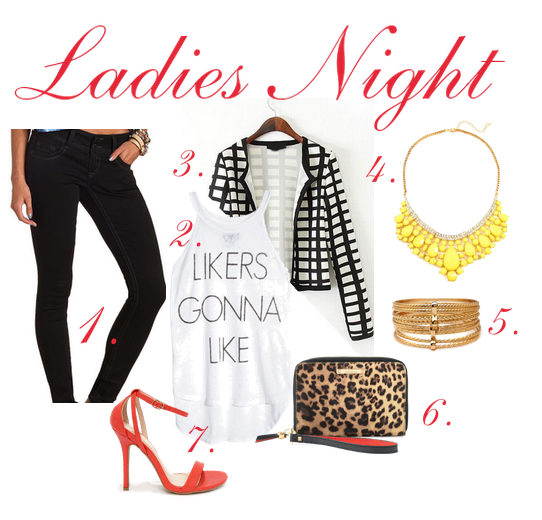 Nothing says girls night out like a hot red heel, pop of leopard and a killer graphic tank. A bold graphic jacket, yellow statement necklace and gold bangles add some serious glam on a look that is definitely one to remember! Styling Le Bump & A Special Announcement!